A few things that may seem out of place to tree climbers in that photo… and not just the lack of PPE. 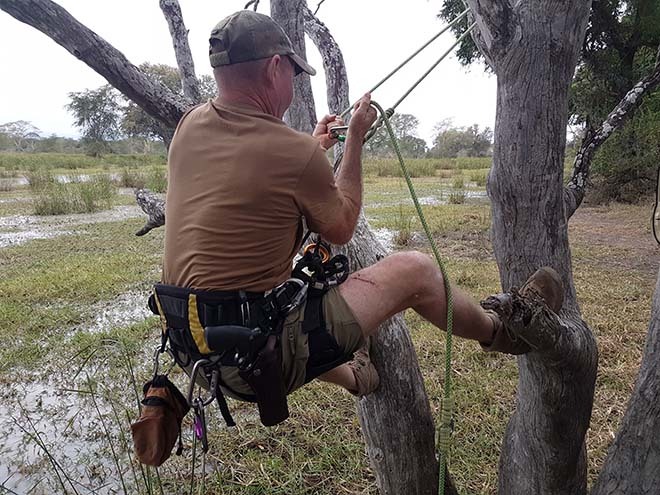 into trees has just returned from Zimbabwe, where we were providing tree climbing training to rangers in the Savé Valley Conservancy. In low country covered in dense, thorny scrub, the huge baobabs which tower over the landscape make natural lookout points, as well as a safe place to sleep when watching over waterholes. It was an incredible trip, with Alex and Angela Witt from Stihl Shop Osborne Park, who donated all of the climbing equipment for the rangers. We stayed with Bryce and Lara Clemence from Advanced Tracking Specialists, who are running one of the most successful rhino protection programs in Africa.